Crêpes Parisiennes is not a restaurant, nor it is a café or a bistro: It is a crêperie. With one crêperie in Shadyside and another one close to Carnegie Mellon on Craig Street, Crêpes Parisiennes serves up crêpes, paninis, espresso, French tea, and pastries to the local community, and Carnegie Mellon students are regular customers at both locations. But what is not common knowledge is that the start of this crêperie is actually closer to Carnegie Mellon than its Craig Street location. 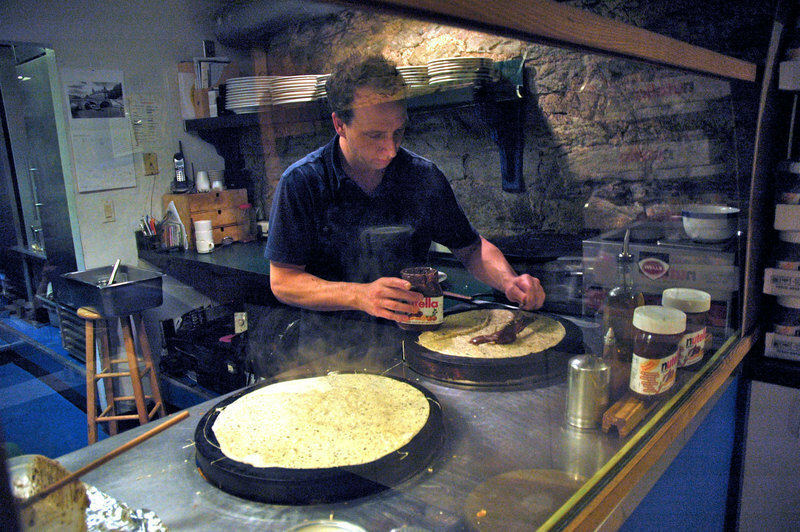 David Handler, the co-owner of Crêpes Parisiennes, discovered his love for crêpes soon after he graduated from high school. In the late 1980s, he spent a semester in the American University at Paris, and while he was there, he noticed that crêpes were on menus everywhere, but there was no place that sold crêpes in Pittsburgh. Later, after working as a photographer around Europe, including five years in Paris’s fashion industry, Handler moved back to the United States and started Crêpes Parisiennes. In 1998, Handler, along with his wife Shannon Reilly, moved back to Pittsburgh and started to sell crêpes from a cart on Margaret Morrison Street, between Posner Hall and Margaret Morrison Carnegie Hall. Handler bought his first crêpe iron with the support of Reilly, who was his girlfriend then. It was right here at Carnegie Mellon that Handler first started making fresh crêpes from the cart and endured the outdoor Pittsburgh weather through its various moods. Handler said that “through rain, sleet, snow, I was out there with my umbrella making crêpes. It was like camping every day.” Selling French crêpes seemed to be the right thing to do at that time, and the international community at Carnegie Mellon welcomed Handler’s crêpes. Later, in 2000, Handler was able to expand his business from a camping crêperie to a more permanent settlement. He bought a coffee shop that was going out of business on Filbert Street, right off Walnut Street, in Shadyside. There, Handler worked hard to modify the coffee shop into a charming crêperie. He was even down on the ground fixing the floor. As the crêperie was being furnished, Handler guarded the crêpe iron in the Shadyside creperie while Reilly left her job as a cancer researcher to camp out at the crêperie cart on Margaret Morrison Street. Later, they closed down the cart and began to work full-time at the Shadyside location. 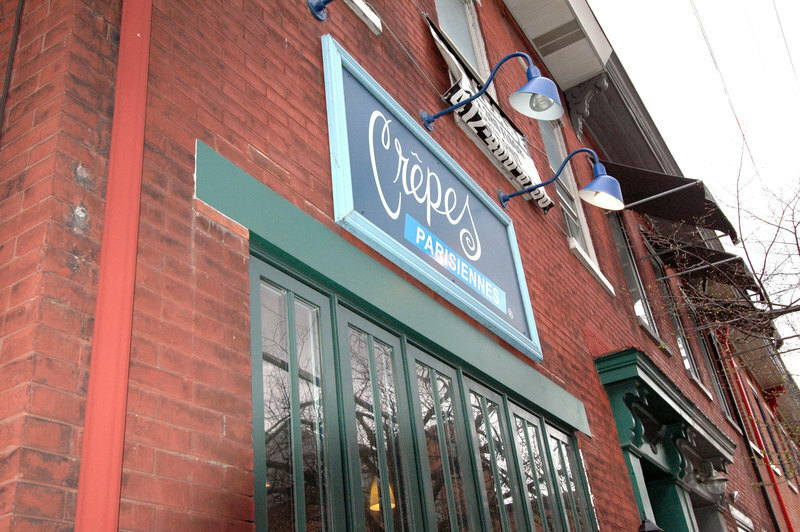 With the support of the Pittsburgh community, Crêpes Parisiennes opened a new location, the now-familiar haunt on Craig Street, in 2006. “I wouldn’t have been able to do this without [Carnegie Mellon]. They recognized that I was doing something. [Carnegie Mellon] faculty, students, and staff supported me and turned my dream into my reality,” Handler said. So, when he was looking for a new location, Handler considered the building on Craig Street due to its proximity to the Carnegie Mellon campus. Crêpes Parisiennes was coming closer to Carnegie Mellon, the place where Handler first started selling his crêpes. At the Craig Street location, Crêpes Parisiennes added paninis and fresh baked goods to its menu, but the star of the show is still the crêpe. Crêpes Parisiennes serves a wide variety of crêpes, ranging from savory ones like smoked Icelandic salmon with chives and crème frâiche ($7.75), to dessert crêpes like the sweet maple syrup crêpe ($4.25). Every crêpe is made from the same batter, consisting of a mix of white and buckwheat flour. Handler uses the American ploy of mixing white and buckwheat flour, a method different from the one used in Paris, where white flour is normally used for savory crêpes and buckwheat flour for sweet ones. Because of his love for crêpes, Handler makes sure he uses quality ingredients, and respects the integrity of each ingredient. The white flour is from a Minnesotan family-owned farm that has been growing wheat and milling flour for over 150 years, and the buckwheat flour is from an organic farm in Pennsylvania. 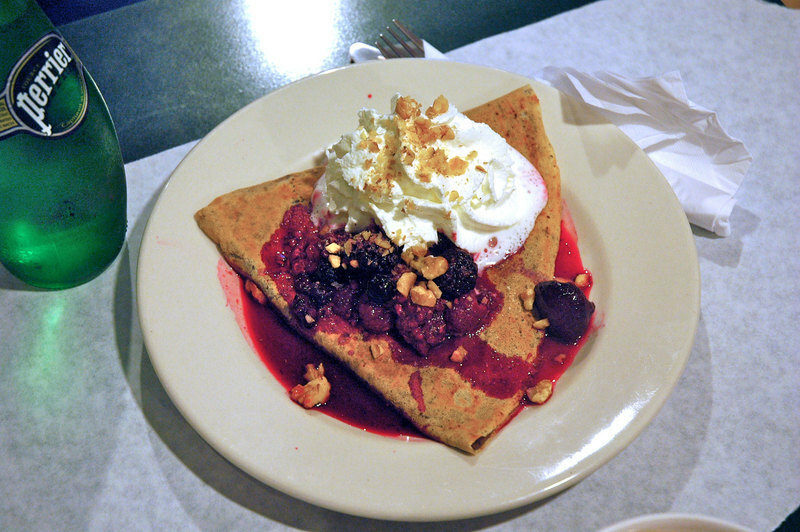 At Crêpes Parisiennes, the crêpe batter not only carries a delicious, clean flavor, but also comes with a history. At the top of the best-seller list of sweet crêpes is the crêpe with Nutella, ($4.75, or $1 more to add banana). Because of this, it is no surprise that there is an entire wall of Nutella stacked up along the bar at the Shadyside crêperie. Customers can also pick a crêpe with plain chocolate, but this brings up the hard decision of picking between dark French chocolate with 64 percent cacao or Belgian white chocolate. Handler uses chocolate coins directly from the package, as he wants to let the richness of his high-quality, and hard-to-find, ingredients show through. The low heat from the crêpe iron melts the delectable chocolate as the crêpe is made, and there is no added cream or butter to distract the customer’s taste buds from the goodness of the chocolate. To cut the sweetness of the dessert crêpe, customers can add berries to any of the establishment’s sweet selections for just $1.25, and with summer around the corner, strawberry,the establishment’s blueberry, and apricot preserves ($4.25), are also available as add-ons. Handler imports these gem-colored preserves from Austria and proudly asserts that there is no added corn syrup in any of the fruit preserves, as corn syrup tends to disturb the natural taste and consistency that each fruit bears. On the savory side, smoked Icelandic salmon with chives and crème frâiche is among the top sellers. The smokiness of the blushed Icelandic salmon, as well as its ocean taste, is highlighted by the bark-colored crêpe. Savory crêpes can be paired up with a choice of savory sauce: soytang, béchamel (a white sauce made by adding milk to roux, a mixture of flour and butter), crème frâiche (a sour cream), or garlic olive oil. All the savory crêpes come with a small garden salad along with mandarin oranges and homemade champagne vinaigrette. Handler personally prefers champagne vinegar to red wine or balsamic vinegar. “I like [the salad dressing] a little bit tart, a little bit acidic, and that is good for your digestion too,” he said. The champagne vinegar used at Crêpes Parisiennes, Handler said, is vinegar from the city of Reims, a city in the northeastern Champagne-Ardenne region of France. On the other hand, the term champagne normally refers to the sparkling wine produced in the Champagne wine region of France, locally within the Champagne-Ardenne region. “The champagne vinaigrette came on the first day we opened up in Shadyside,” Handler said. The same vinaigrette is mixed every day, and the touch of sectioned oranges in the salad adds a fresh, sweet flavor to the bitter of the green leaves. This green salad is a little mid-summer garden to be enjoyed all year long. Reilly adds her touch to the menu, too, with her homemade scones. Reilly, who normally flips crêpes at the Craig Street crêperie, bakes these scones that are meant to be eaten with tea, and as luck will have it, Crêpes Parisiennes imports a special type of tea, Mariage Frères, that is adored by tea lovers. Mariage Frères is considered by many avid tea drinkers to be the best teahouse in the world, consistently producing high-quality French tea. As told by the Mariage Frères website, the history of Mariage Frères can be traced back to 1660 when King Louis XIV of France and the French India Company commissioned Nicolas Mariage to sign a trading agreement with the Shah of Persia. Since then, the family traded spice, tea, and other colonial goods from the East to Europe. Later, in 1845, the Mariage family set up the Mariage Frères Tea Company, trading as far as China and Sri Lanka. At first glance, what is the most noticeable is that the Mariage Frères tea bag is made out of muslin cloth and not paper. This is mainly because paper leaves a distinct papery taste. While other varieties of tea have sharper fragrances and tend to taste more acidic, Mariage Frères tea has a soft, velvety aroma and a true tea flavor. At Crêpes Parisiennes, a cup of French tea will set you back $2.00. Apart from French tea, Crêpes Parisiennes also brews café au lait, a French espresso with steamed milk and light froth for $2.50. Chocolat chaud, a rich and dark form of hot chocolate, is available for coffee abstainers. Handler proudly announces that their hot chocolate was voted the best in the city. “There’s no syrup. We melt chocolate. We put cocoa and melted chocolate and milk and, you know, secret stuff,” he said. Because of the proximity of the Craig Street location to the Carnegie Mellon campus, Handler sees a very mixed crowd at his crêperie. “It’s like the UN in here sometimes....” he said. “I appreciate the nationalities.” Here at Crêpes Parisiennes, French food takes on an American twist, plays with Dutch chocolate, and is adorned with Austrian fruit preserves. Next time you step into Crêpes Parisiennes to savor a crêpe, take a moment to remember the journey that the meal has been through before it is set down in its final form; warm on your plate.